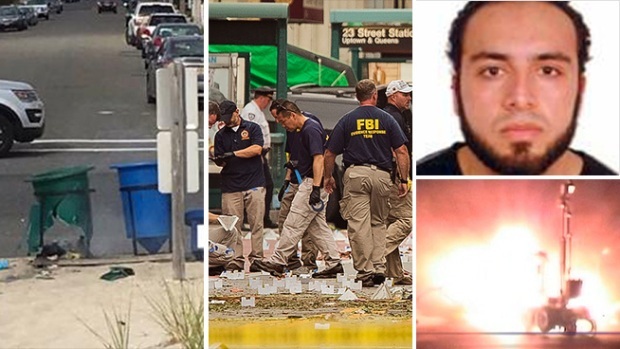 Ahmad Rahami, a 28-year-old U.S. citizen born in Afghanistan, was taken into custody Monday after a gun battle with police in Linden, New Jersey, that left two officers injured, four law enforcement sources and other officials said. Cuomo, speaking near the scene of the Saturday night blast, told reporters a second device found blocks away from the first explosion appeared "similar in design" to the first, though investigators are still examining it after it was removed by a bomb squad robot and taken to a police facility in the Bronx. Cuomo added that whoever is responsible for planting the device "will be brought to justice." The bombing rocked the city's Chelsea neighborhood, a mostly residential part of Manhattan's west side known for its art galleries and large gay population. Witnesses described hearing a deafening blast, and surveillance video footage captured images of nearby windows being blown out by the explosion as people sprinted away from the scene. Cuomo said, as a precaution, close to 1,000 additional State Police and National Guard troops will be dispatched across the city to guard transit stations and area airports. Mayor de Blasio said Sunday that authorities don't yet know who made it, who set it off or the motivation behind it but called the blast an "intentional act." The mayor added that there is "no specific and credible threat against New York City at this point in time from any terror organization." Meanwhile, authorities said the same man was was seen at the 23rd Street and 27th Street locations before the blast. Police are enhancing and comparing the videos from the scene as they continue their investigation. Law enforcement sources say police are in possession of a video that shows a man putting an object in a dumpster near 23rd Street and Sixth Avenue, followed by an explosion some time later. 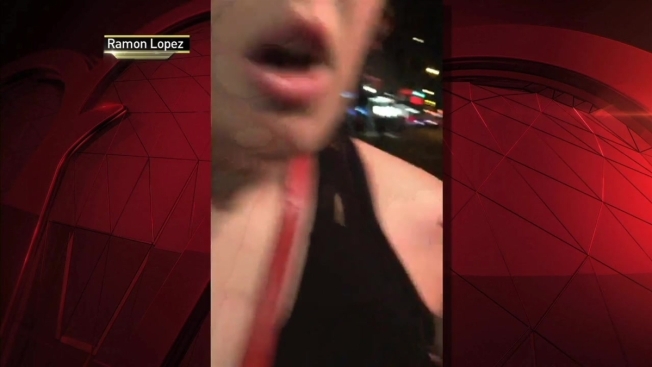 Another video from 27th Street shows a man leave a piece of luggage on the sidewalk before two other people come along, take a device out of the bag and walk away with just the suitcase, officials familiar with the investigation said. President Obama was briefed on the explosion, according to the White House. The FBI and Homeland Security officials, along with the Bureau of Alcohol, Tobacco, Firearms and Explosives and a New York arson and explosive task force, were at the scene. The NYPD also removed a possible secondary device on 27th Street, four blocks away. Four law enforcement sources described the device as a pressure cooker that had what appeared to be protruding wires, a cell phone and black tape. The NYPD tweeted that it had been safely removed to Rodman's Neck Range in the Bronx just before 2:30 a.m. Sunday. The device was rendered safe and sent to the FBI Laboratory in Quantico, Virginia, for a forensic examination. Saturday night, photos posted to social media showed an extensive emergency presence at the scene, with the area between Sixth and Seventh avenues cordoned off. Sixth Avenue was closed from 14th to 34th Street and NYC Transit reported extensive disruptions to the 1, 2, E and F subway lines. Street closures continued Sunday. Crosstown traffic was closed in both directions from West 14th Street to West 32nd Street between Fifth and Eighth avenues. The closures are in effect until further notice, the mayor's office tweeted. While there was no damage to the subway system, NYPD Chief of Transit Joseph Fox tweeted that police will need to keep the 23rd and 28th street subway stations closed along Seventh Avenue as they investigate. He plans to tweet another update on those lines Monday at 7 a.m.
"We'll reopen stations as quickly as possible while conducting a complete and thorough investigation," he tweeted. "Appreciate your patience and understanding." There was no damage to the subway system and the MTA expects full service to resume Monday morning at all stations near the scene of the blast, Cuomo said Sunday. The Port Authority will resume PATH service on the 33rd Street line beginning at 5 a.m. Monday, but trains will skip the 23rd Street station due to the ongoing police investigation. PATH trains will make stops at the Christopher, 9th, 14th and 33rd street stations. At least one Twitter user tweeted that her "whole high-rise building shook" from a apparent blast. Another image showed a Dumpster or trash bin blown apart, with bits of debris scattered on the sidewalk. People at least seven blocks away reported hearing and feeling a loud boom. Law enforcement sources identify this pressure cooker, with wires and a phone attached, as the device found on 27th St. in Manhattan following an explosion on 23rd St. on Sept. 17, 2016. The Standard Hotel's offer of a free room and dinner Sunday night to residents on 23rd Street between Sixth and Seventh avenues quickly booked up the venue, and it said in a subsequent post on social media that it would look to see if other hotels in the area could accommodate the demand. Earlier Saturday, one of three bundled pipe bombs placed in a trash can along a 5k race route to be run by Marines detonated in Seaside Park, New Jersey. The race had been running late, but authorities said they believed the device had been timed to explode as runners went by the trash bin. No one was hurt in the explosion. Investigators are working to determine if the New Jersey explosion is linked to the Chelsea blast and the pressure cooker found on 27th Street. Old-fashioned flip phones were found on all three devices, law enforcement officials close to the investigation told NBC 4 New York. FBI investigators also searched a livery cab in midtown for evidence from the explosion Sunday afternoon. The driver of that cab was riding on 23rd Street when the blast went off and shrapnel from the explosion may have hit his car. The driver called 911 and pulled over near the intersection of 39th Street and Madison Avenue, which is where FBI investigators were gathering evidence Sunday. Security concerns on the Jersey shore also continued Sunday. The San Gennero Festival in Belmar was canceled because of safety concerns, Mayor Matt Doherty tweeted.